Since as far back as I can remember I have loved creating art. As a child encouraged by my parents, my days were spent drawing and painting and I always had a pencil or paintbrush in my hand! At school art was my favourite subject, and after going to university to study Graphic Design & Modern Art, I count myself very lucky to have maintained a successful career in the art and design world, working as a Graphic Designer, and for the last eight years as a professional artist. I love being creative and painting is the ultimate creative addiction and a complete passion for me. The biggest reward is the satisfaction I get every day from painting, it makes me feel extremely lucky and I still get a buzz. I am a bit of a perfectionist often getting drawn into a painting, spending days adding texture & layer upon layer of colour until I create the effect I am striving for. Living in the North East of England near the coast and within easy access to the countryside has been a huge inspiration for me. From the colours and texture on the bark of an old tree, to the form and reflection from a rock pool on the coast. All these inspirations feature consciously and unconsciously in my paintings. I love to working on large scale, with mixed media, acrylic and enamel paint which gives my art more depth and interest, creating colourful and energetic modern abstract paintings. Throughout all of my work there exist the core elements of vibrant colour, bold shapes and strong composition. 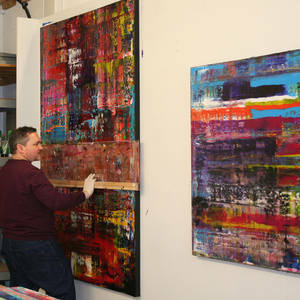 All my paintings are unique, original, and created by hand in my own Studio in the Tees Valley. Each painting takes arounds 20 days to complete. Created lovingly by hand, building up layers of texture and bold colour. I use a number of different elements and compounds which gives my paintings a textured quality. I love to be experimental, starting with a general idea but enjoy watch each painting evolve through the creation process, seeing how the strong bold colours interact with the textured media. My style is abstract in its roots and inspired from my original love of abstract art, which I had from an early age. I have always been mesmerised by the abstract detail from artist like Turner, Constable, Picasso, Mark Rothko, Jackson Pollock Willem de Kooning, and more recently Jake Attree Damien Hurst and Gerhard Richter.